By special request from a friend (Davey), I'm making a multiplayer decklist built around Lighthouse Chronologist. Just look at the card and you can see why he would pick it. At the end of each opponent's end step you can take an extra turn. The more players the merrier for you. Before we dare take a step further into the land of screwing up the time space continuum, you need to be informed. Level up, can only be used as a sorcery, which is honestly some kind of terrible. That's what keeps this card from being top tier. You have to waste mana on your own turn and to make matters worse, he starts at level zero. Lame huh? You basically have to pay nine mana for this guy to do what you want. Just like any venture into time, you need careful planning. So one major tip is DON'T play this card too soon. You're just going to have to protect it for that many more turns before you can level it up enough. Always leave mana open to protect this with counterspells. You've got a lot to consider to keep Chrono alive. In the famous words of Dr. Brown, "As long as you hit that wire with the connecting hook at precisely 88mph the instant the lightning strikes the tower... everything will be fine." Now that the warnings are out of the way, here's the keys to the DeLorean. Let's get that flux capacitor... fluxxing. Funny enough, when I was looking at Chrono, the first thing that came to mind was strangely Fatespinner. I don't know why really but I decided to just take the idea and run. After tripping a couple of times I stumbled upon some ideas from the past. So I brought those ideas back to the future. 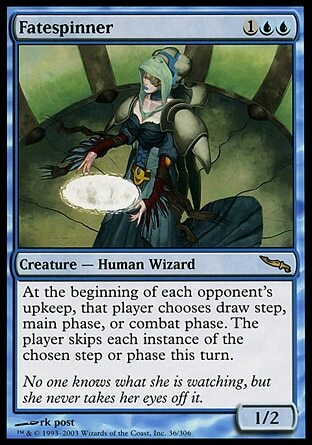 Does everyone remember the Brine Elemental and Vesuvan Shapeshifter combo made famous by the Pickles deck? For those that need a refresher or don't feel like raising their hands in class, the combo works like this. If Briney is turned face up, he skips all of your opponents untap steps. Our friendly neighborhood Shapeshifter decides it's a good idea to turn into Briney and pass the savings onto you. So you cast Shapey as a morph creature, then pay 1U to flip him up and copy Briney, activating the trigger to skip everybody's untap step. He also has the fine print of being able to go face down again during your upkeep so you just pay 1U again each turn to keep doing this over and over until someone throws a chair at you. Then I remembered our pal Teferi. Unlike the kind person he is in the storyline, his card is quite the jackass. So let's get a running total here. 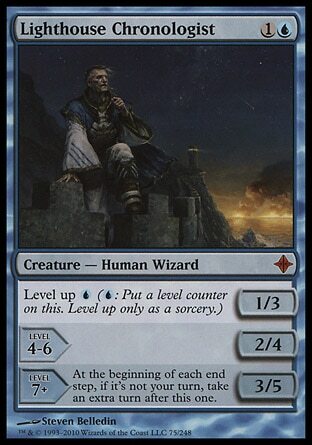 We've got a wizard that forces each opponent to skip either their draw step, main phase, or combat phase, a pair who constantly prevent each opponent from having an untap step, and another wizard that prevents them from playing instants or cards with flash during turns that aren't their own. To make matters worse for them, we're trying to get our Chrono to level seven to "trigger" (hence the deck's name) his ability. So not only are their turns ruined but we're playing around with time and getting extra turns. So I decided to add one last piece to this scary defense: Kira, Great Glass Spinner. Ridin' spinners indeed. Sun Droplet. This card is always amazing in multiplayer. In fact, most groups have to ban this or else everyone will play them. If your group doesn't ban them then you get the added benefit that you can take even more turns and you will most likely draw into multiples with the different card draw spells that will be added. This will be an early defensive measure and later on will prevent most from ever killing you. Remember that the key is, it says "every" upkeep. Echoing Truth. This is a swiss army knife. You can use this to wipe out an army of tokens, bounce one of your own creatures back to your hand to save it from being destroyed, or bounce back a major threat that someone slipped past your defenses. I have a bad habit of adding it to most of my Blue multiplayer decks. Any kind of counterspell. Counterspells aren't usually that great in multiplayer because there are just too many opponents. Having a few though might save your life or prevent that blasted Wrath of God from ruining your day. It's best to find one that either draws you a card (cantrip style) or can be reused. Sphinx of Jwar Isle. Also known as Jwar Jwar Sphinx. This is your major win condition but many other options will work just as well. Find something that works for you. This one is just handy due to having Shroud and some evasion. The last card is one that hasn't come out yet. Jace's Ingenuity. It's instant speed card draw so you can play at the end of your opponent's turn just before it comes back to you again. I'll say this much. This isn't my best multiplayer deck by any means but it is an idea I want to see playtested. There were so many cards fighting for spots in this but these are the ones that stood out to be more necessary. I personally like the theme of adding every possible way to screw up an opponent's turn while jumping through time. Davey, I hope you enjoy this one. Just don't play around with time to the point you don't exist after your friends throw enough chairs at you. I'm not going to suggest expensive options for this particular deck. This is merely the first version of it and would need playtesting and fine-tuning before thinking about what could be taken out. Jace, the Mind Sculptor, Cryptic Command, and others are just kind of obnoxious anyways right?